The Milkhouse Apple Strudel Candle 8 oz. Milk Bottle is like fresh apples baked with juicy raisins in a fragrant blend of spice topped with a buttery crumb strudel. This will take you right back to Grandma’s kitchen on baking day. Give your country home a cozy scent with the Milkhouse Cabin Fever Milk Bottle. The aroma is a woodsy, warm, and spicy blend that's sure to enrich any space. 60 hours of burn time, soy wax infused with beeswax - 100% paraffin-free. Milkhouse Citrus Balsam made of balsam fir & sparkling notes of orange, grapefruit, & crushed cranberries with a background of sandalwood, clove & cinnamon in a Milk Bottle. 50 hr. burn time, made in USA, soy wax infused with beeswax,100% paraffin-free. 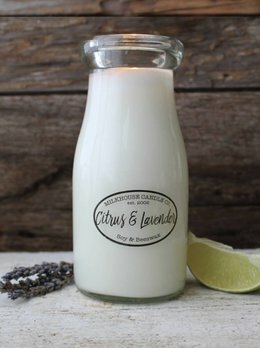 You'll love the Citrus & Lavender 8oz Milkhouse Candle and it's clean, tart citrus notes combined with fresh fields of lavender buds. A very clean fresh fragrance for your entire home. Get ready to love this scent! 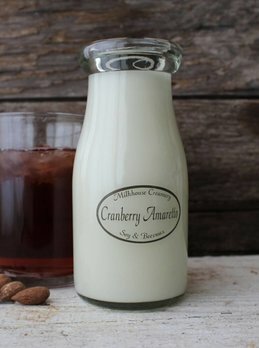 Ripe red cranberries combined with the famous almond liqueur. 50 hours of burn time. Made in the USA. Soy wax infused with beeswax - 100% paraffin-free. 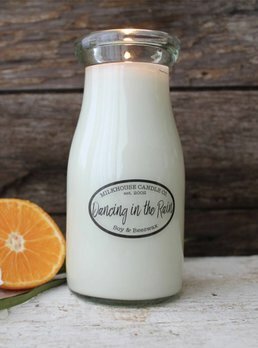 The Dancing In The Rain 8oz Milk Bottle is like a summer rain on orange blossoms, summer orchids, & wind swept grass. You're going to love this brand new scent. Be sure to also check out our Milk Bottle carriers! A perfect way to display your favorites! 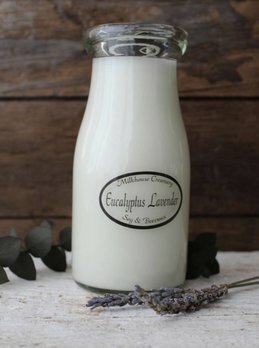 The Milkhouse Eucalyptus Lavender 8 oz. Milk Bottle is a refreshing up-to-date blend of lavender and the exotic spice notes of eucalyptus. Very warm and inviting. 50 hours burn time, made in the USA. Soy wax infused with beeswax - 100% paraffin-free. 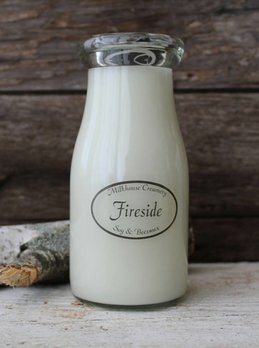 The Milkhouse Fireside Candle 8oz Milk Bottle is destined to become your favorite! Fills the entire house with the rustic warm fragrance of smoldering fire wood with Milkhouse's famous scent made from their signature soy and beeswax blend. 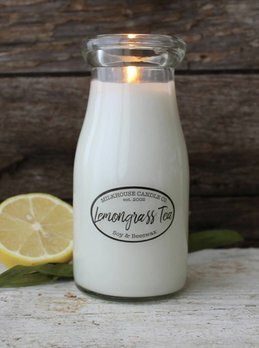 The Lemongrass Tea Milk Bottle Candle is an earthy uplifting fragrance. Fresh green notes with hints of Meyer lemons and sweet ginger. 50 hours of burn time. Made in the USA. Soy wax infused with beeswax - 100% paraffin-free. 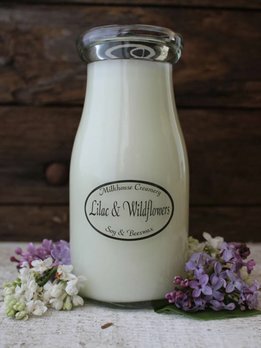 Milkhouse Candle Lilac & Wildflowers 8oz Milk Bottle is a floral delight of lilac blossoms combined with sweet pea blossoms, daisies, hyacinth, & clover. In the famous Milk Bottle glass, cotton wick; 50 delightful hours of burn. 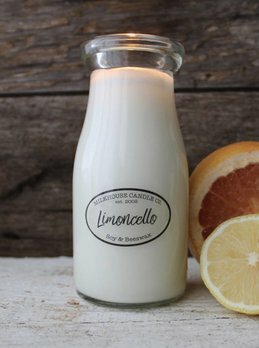 The Milkhouse Candle Limoncello 8oz Milk Bottle is a lively fruity melange of fresh citrus, juicy melon, cane sugar and a hint of lemon zest; inspired by Italy's favorite limoncello beverage. Cotton wick; 50 unsurpassed hours of burn. 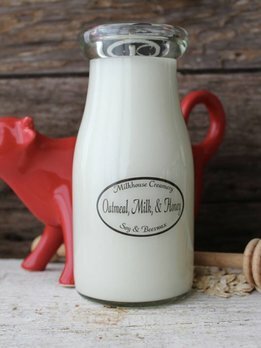 The Milkhouse Candle Oatmeal, Milk & Honey 8oz Milk Bottle fills your home with the scent of fresh-baked oatmeal cookies dipped in whole milk, drizzled with true sweet honey. Subtle cherry notes complete this delicious treat!